Despite numerous scoring opportunities, Kennett's defense held off Downingtown West for most of the first half. For the first half of an Oct. 2 game against Downingtown West, a young Kennett squad matched up pretty well against one of the leading teams in the Ches-Mont League. In the first half, most of the action took place on a small patch of the field as Downingtown West’s offense consistently pressured Kennett’s defense—but the visiting team was unable to get a shot past goalkeeper Karyna Colon. Even though Downingtown West’s offense executed well and did a nice job of passing the ball, Kennett’s defense matched the effort by repeatedly denying the Whippets scoring opportunities. 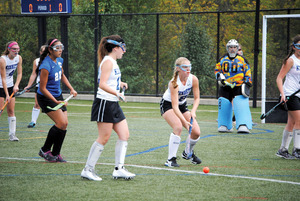 Vicky Gallivan and Jordan Goddard led the effort to stop Downingtown West. Shumway said that both players are hard workers with great instincts. When Downingtown West was able to get a shot on goal, Colon made several nice plays to prevent a score. Colon finished the game with 19 saves. Downingtown West capitalized on a fast break opportunity and scored the first goal of the game with 8:44 left in the first half. The Whippets carried that 1-0 into the second half and continued to apply almost constant pressure to Kennett’s defense and eventually tacked on three more goals for a 4-0 win. 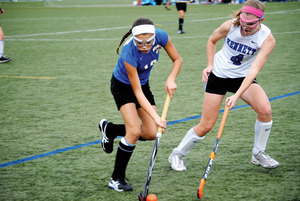 The victory improved Downingtown West's record to 6-1 in the league. Downingtown West’s scoring came from Taylor Johnson, Savannah Cabaddu, Katie Hoerman, and Nikki Freeman. Kennett could take away some definite positives from the game. Some of the younger players on the team have gained valuable experience at the varsity level while the team has compiled an overall record of 5-8. Shumway noted that, as the 2014 season has progressed, Kennett has been hit hard by injuries. One of the more significant injuries for Kennett was to standout mid-fielder Haeli McCabe, who tore an ACL early in her senior season. Her junior season was also shortened because of a torn ACL, and Shumway said that the injuries were heartbreaking because McCabe missed so much playing time during her high school career. McCabe is going to play at the collegiate level at the University of Connecticut. As Kennett concludes the second half of the 2014 season, Shumway said that she wants her young team to continue to work hard to improve and to learn from mistakes.